Recap: Music Director Marcelo Lehninger makes momentous debut with Grand Rapids Symphony in St. Cecilia Music Center. A new artistic leader’s arrival in a new home is a series of firsts. There’s the first announcement, first public appearance, first performance and on it goes. Friday’s first was Music Director Marcelo Lehninger’s debut in St. Cecilia Music Center, home of the Grand Rapids Symphony’s Great Eras Series and Coffee Classics Series. 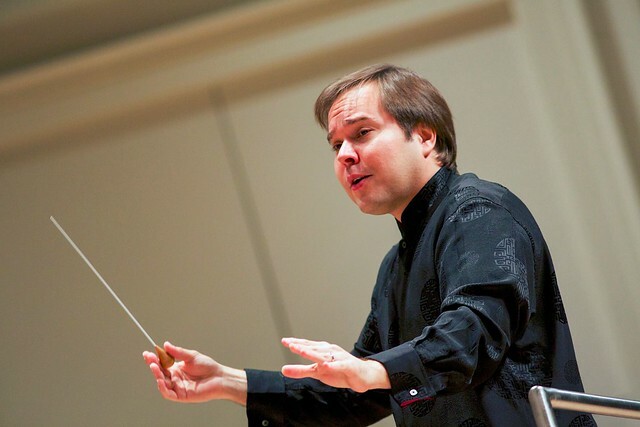 It was no less exciting than the rest of the Brazilian-born conductor’s firsts ever since he was named Music Director of the Grand Rapids Symphony in June 2016. In some respects, it was even more of an occasion in the second home of the Grand Rapids Symphony. Previously, Lehninger appeared twice in DeVos Performance Hall as a guest conductor prior to his appointment. But it was in his new role as artistic leader of the Grand Rapids Symphony, for the Porter Hills Coffee Classics Series in the morning and the Crowe Horwath Great Eras Series in the evening, that Lehninger made his debuts on in Royce Auditorium on Jan. 6, 2017. It was momentous because of St. Cecilia Music Center's role as the “mother of the arts,” giving birth to much of Grand Rapids’ musical community, since the opening of the historic building in 1896. It was momentous as well simply because of the quality and character of the performance featuring a young artist as well as a new artistic director. Guest pianist Daniel Hsu, a 2016 Gilmore Young Artist of Kalamazoo’s Irving S. Gilmore International Keyboard Festival, was soloist. The gifted young pianist wowed a nearly sold-out audience at Friday evening’s concert. The Grand Rapids Symphony’s Great Eras Series is a set of concerts, each devoted to a particular era in musical history. The 2016-17 season opened in October with music from the Classical Era, and it concludes in February with music of the Baroque. The Romantic Era music of Schumann and Brahms was on the program on Friday, a fitting debut for Lehninger because many a great conductor’s career has been grounded in conducting the major German works from Beethoven to Brahms. Lehninger, just 37 years old, demonstrated he’s on a path to greatness. The former assistant and associate conductor of the Boston Symphony Orchestra, handpicked by James Levine for the job, led performances of precision and passion, exciting at times, introspective at others. Lehninger’s first number was Brahms’ Tragic Overture. The performance was anything but. It’s a turbulent piece that gives a conductor and an orchestra plenty of elbow room to maneuver. Lehninger’s performance had a nice ebb and flow with a wonderful balance of robust exuberance and gentle introspection that plumbed emotional depths without getting swept away by them. Brahms’ Variations on a Theme by Haydn is a popular work. What’s more, it makes for an easy and concise way for a listener to size up a conductor in a short span of time. Beginning with the regal, stately theme, Lehninger proved to be a conjuror of many spells through eight variations contrasting from the intense objectivity of the first variation to the understated motion of the third. The explosive fifth variation was a hair raiser, but the performance clean and delightful. Hsu, no more than 20 years old, performed brilliantly Robert Schumann’s Piano Concerto in A minor. It’s a singular work that explores the split personality of its composer. It’s also a work that Schumann composed for his wife, the brilliant virtuoso, Clara Wieck Schumann. Though it’s a showpiece, it’s much more than piano and accompaniment. It’s a quasi-symphonic piece, and Lehninger made ample use of it to show off the musicians of the Grand Rapids Symphony. Hsu and Lehninger made for a fine collaborative team. The opening movement pushed all the necessary emotional buttons. Hsu took it even further with a dazzling journey through the lengthy cadenza. Lehninger drew from the orchestra a lush string sonority that enveloped the exposed piano in the intermezzo middle movement. The finale was grand and glorious, a display of power with crashing chords and poise in sustained trills by Hsu. Royce Auditorium is a marvelous acoustic though it takes time to learn its nuances. It’s going to be a pleasure seeing what magic Lehninger and the Grand Rapids Symphony make there in the years to come.